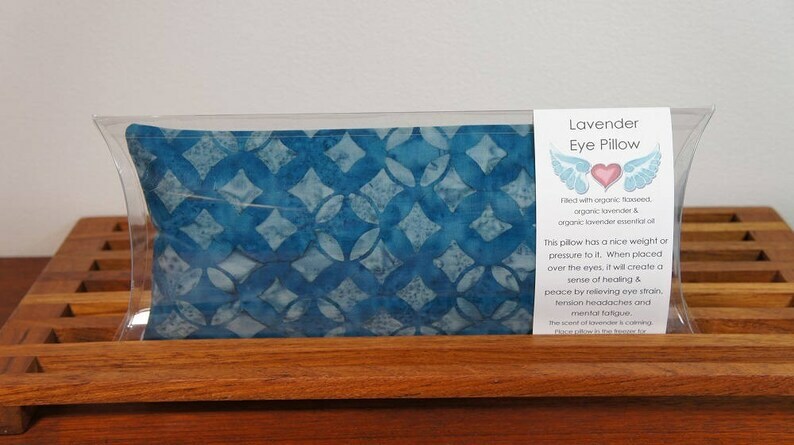 This Yoga practice supply/tool, The Lavender Eye Pillow is filled with *ORGANIC* flaxseed and Lavender essential oil. The Eye Pillow has a nice weight or pressure to it which makes it, the perfect tool for Savasana. When placed over the eyes, it will create a sense of healing and peace by relieving eye strain, tension headaches, and mental fatigue. The scent of lavender is calming. Keep handy by the bed, a comfortable chair or Yoga mat. Put pillow in the freezer to help soothe away stress. approx. 3.5" x 8.5" rectangular shape, made of 100% cotton muslin and comes with a removable, washable pillow case in 100% cotton batik. Because Eye Pillows are handmade, sizes may vary slightly.